Initially I tried some hooks from Bunnings, however they didn’t fit over the rod very well. Instead, I found these ‘S’ hooks at the local dollar shop, 3 for $2…bargin! My handbags sit on the rail above my jewelerry area. How do you organise your handbags? OMGosh what a great idea to use those hooks!! I will be keeping an eye out for some next time I am out and about. I don’t have many handbags, an everyday one, and small going out one and maybe two others, currently all but the everyday one are hanging on the back of my bedroom door handle. My sister is the Imelda Marcos of handbags though so I will definitely have to tell her about your hooks! It’s a great idea, easy to get to as well. I was looking for those S hooks for a different project. Didn’t think to look in the dollar shop! Great idea for storing bags. But I don’t have enough wardrobe space to do that. Any other ideas? What about creating something on the back of a door? What a great idea!! I might need to have my own wardrobe just for my handbags!! They are handy hooks. What else did you use them for? Have you completed the first decluttering challenge of the year. Turn your coat hangers?? Just make sure the ones you get will fit over your rails. What a clever idea, don’t you love $2 shop bargains! 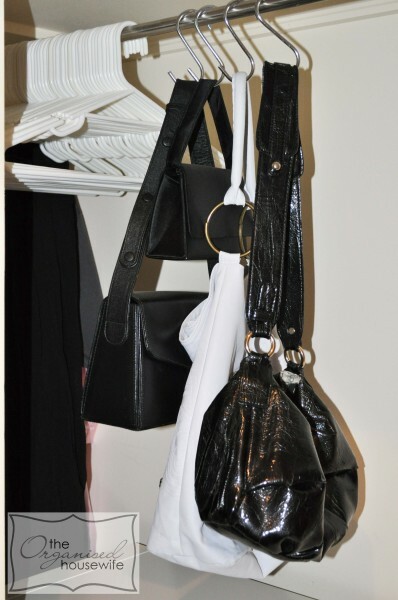 For those who are limited in cupboard space and can’t manage this (like myself) I have another solution – I’ve always kept my handbags on a HAT STAND. You know those old-fashioned hat stands with arms out in every direction? You can still buy them at Copperart or you can pick them up for a bargain at Op Shops. Great idea! I am super excited about the big walk in wardrobe I will have in a few weeks when we move into our new house, and want to get off to an organised start. My handbags are all over the shop right now. Now off to find me some of those hooks. About 6 months ago I had a clean up in my 5yo daughter’s bedroom. She has a rail that runs the length of her cupboard which continues over the top of her shelves (only 2, so plenty of space left). I decided to use that space for her small handbags, carry bags, carryalls, necklaces, tiaras, other dress up stuff, lanyards, etc, etc. And, yes, I also found these hooks at the $2 shop. They are fantastic because we still only need to take one necklace off at a time and a heap fit on one hook.